Chances are, at some point during your childhood, someone told you to eat your carrots because it would help you see further or more clearly. Is that really true, though? If so, how do carrots help your vision? Like many of these long-held views that link a specific food to your health, there’s actually some truth and a little myth. Read on to learn the impact that carrots have on your vision and eye health, the misconception about that link, and where it originated. Carrots contribute a huge amount toward your daily requirements for vitamin A, a vitamin essential for eye health. NutritionData shows that a 5 ½-inch long raw carrot (50 grams) provides 167 percent of your daily requirement for vitamin A. Think of it—eat a single carrot and you’ve easily met your vitamin A needs for the day. Why is vitamin A so important for your eye health? The American Academy of Ophthalmology (AAO) explains that vitamin A deficiency prevents your body from producing pigments it needs for the photoreceptors in your retina to function properly, which can impact your night vision. SFGate Healthy Eating further explains that your body converts the plant pigment beta-carotene into vitamin A. Carrots are high in beta-carotene. Although you can get vitamin A from a number of different sources, including other orange vegetables like squashes and sweet potatoes, SFGate states carrots as the best source of any vegetable for beta-carotene. The AAO goes on to say that vitamin A also serves as an eye moisturizer to keep your cornea and other parts of your eye lubricated and nourished. Sadly, as All About Vision notes, an estimated 250,000 to 500,000 children each year go blind each year due to vitamin A deficiency. Typically, this happens in developing countries where malnourishment is a big issue. Smithsonian Magazine asserts that the connection between improved eyesight and carrots stems from a World War II propaganda campaign. At that time, the British Royal Air Force had developed and was using radar technology that allowed them to “see” German planes at night. To keep the Germans from understanding the advantage they’d gained, the British government told news sources that their pilots could see the planes at night because they ate carrots. The truth is, carrots are undeniably good for your eye health. All the times your parents told you to “eat your carrots,” they were doing you and your eyes a huge favor. However, don’t expect to eat a bag of carrots and find that what was once blurry comes into sharp focus. Carrots protect your eye health and vision; they don’t improve it. 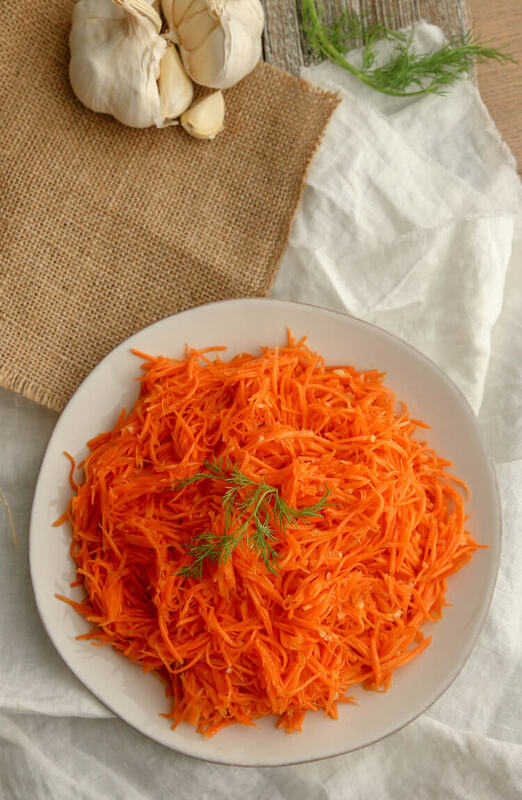 To encourage you to eat your carrots and get a huge dose of vitamins, try preparing this Carrot Salad recipe. Shred 2 lbs of carrots. 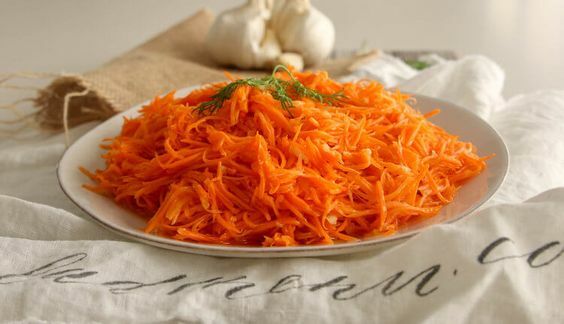 (You can use this Kuhn Rikon Julienne Mandoline) *If you are using organic carrots, you don't need to peel them, just cut off the ends. To the carrots add in 3 Tablespoons cane sugar, 1 teaspoon salt, 1 teaspoon ground black pepper, 1 teaspoon ground coriander and 5 Tablespoons white vinegar. Mix well. In the center of the carrots add into 10 minced garlic cloves. On a stove top heat 1/2 cup of grape seed oil, just till you start seeing a little bit of steam.